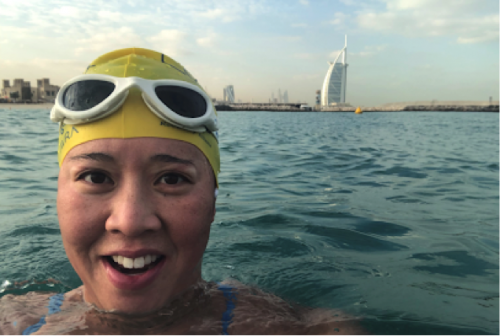 After she completed her historic HK360 swim around Hong Kong Island in November 2018, I spoke with Edie Hu about the swim, her training, and her passion for swimming. Before speaking with Edie, I was expecting her to have had a serious training plan, with her life revolving around her training for the event: sleeping, eating and breathing swimming. All through Edie’s childhood and in college, she swam and competed at a high level. After college, she took a break from swimming – one that lasted for 15 years. It wasn’t until she moved to Hong Kong that she rediscovered her love for swimming, and this time it was in open water swimming. What was it about open water swimming that helped Edie realize her love for swimming was always there? Swimming in college was very structured: you belonged to a team with a common goal and there was always a time or another swimmer to beat. Open water swimming gave her a sense of freedom. Rather than swim for time, she swam for completion. It provided Edie with more variety in her swims, as there was always something different she could not plan for, such as, currents, landscapes and weather. This variety was much more stimulating than swimming laps in a pool. Every swim in the open ocean was different, which made it memorable. I don’t remember my times at college but I remember my swims in the open water. The race started in 1976 when Cathay Pacific sponsored Australian professional swimmer Linda McGill to swim around Hong Kong Island, which is 45km long. Linda faced many struggles such as bad water quality and heavy boat traffic. 41 years later, Simon Holliday did the same swim in November 2017. Edie — who was his training partner and support swimmer — was inspired. 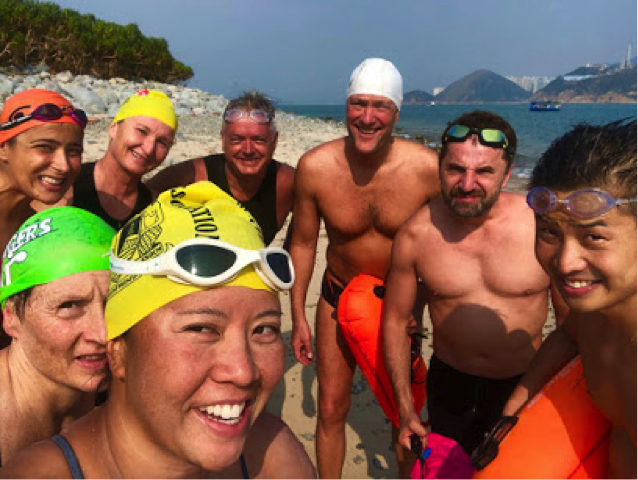 So when Shu Pu, the organizer behind the HK360 swim, approached Edie about being the second female ever to swim around Hong Kong Island, she knew she couldn’t refuse. There were a number of reasons why Edie said yes to the swim. 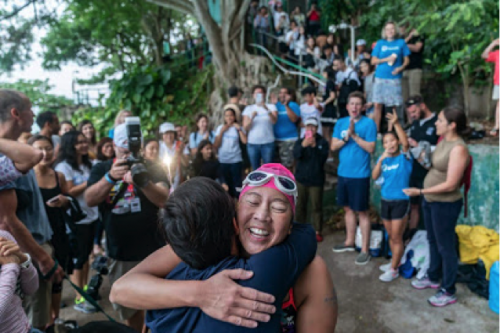 She wanted to be the first woman in 42 years to do this swim, and also be a role model and pioneer for Hong Kong. More importantly, she wanted to put Hong Kong on the map for open water distance swimming, and raise awareness about the beauty of Hong Kong. That there is more to the city than just the skyscrapers everyone sees in photos. I wanted to show a side of Hong Kong that people don’t normally get to see. Edie took an alternative philosophy to training; one which I believe we should adopt. “It was very organic and unstructured,” said Edie. She would listen to her body and her mind, and train accordingly. She would ask some friends to join her swims, which made training more fun and enjoyable. She would also workout with two trainers, focusing on stretching and strength building. Edie explained that while many people feel the need to train six days a week, she wanted training to last and not get injured. This training philosophy is something that many of us forget; that sometimes it’s not about training for just the one race, but better to maintain a constant standard of training. This will create a more sustainable and healthier lifestyle. Although swimming is often perceived as an individual sport, Edie still had a team to help and support her throughout the race. 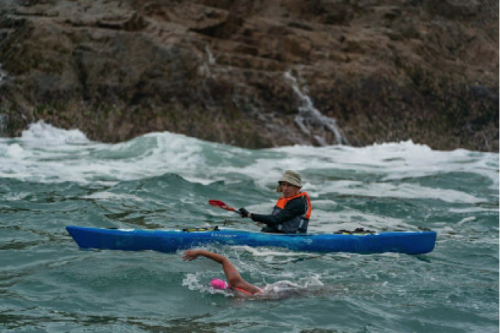 This team included two kayakers taking turns to guide her, one friend in charge of feeding her, and one friend working on social media updates, as well as several support swimmers who would take turns and come in every three hours for up to 45minutes, to help Edie keep up the pace. The team also included a sailboat captain and navigator who planned the route to find the most time efficient course. Without this team Edie would not have been able to complete the HK360 as successfully as she did. Edie completed the swim in 12 hours and 37 minutes, setting the record for fastest woman’s swim time, beating the 1976 record by 5 hours. The great thing about the HK360 is that there are so many firsts. When Simon Holliday completed the HK360 in 2017, he was the first male to do so, and set a new world record time for an individual swimmer of 12 hours and 34 minutes. Edie is the first non-professional female to complete the swim. Two weeks after Edie had completed her swim, a five-man relay team called The Drifters, became the first relay team to complete the swim. All of these firsts are inspiring other people to become part of a historical event helping bring open water swimming to Hong Kong. I don’t think Edie, Shu Pu, Simon or The Drifters realise that together they have set in motion the growth of this event, and in so doing, inspire many people to start open water swimming. Importantly, by swimming the HK360, Edie was able to raise 700,000HKD for a charity she has been involved with since the beginning called Splash. This fundraising not only helps Splash grow, but it also gives the charity some great publicity and visibility. Edie’s hope is that by building stronger links between Splash and the HK360, they can go on to inspire more of Splash participants to set goals and pushing themselves to test their limits. 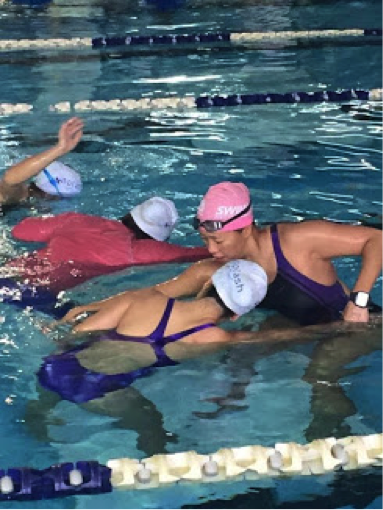 Splash is a foundation that gives free swimming lessons to the underprivileged community in Hong Kong. Edie is one of the members and coaches who founded the charity in 2015. Since then, the charity has grown exponentially through word of mouth. They have taught over 1,400 people how to swim, and hope to teach 5,000 people by 2020. Edie first started coaching swimming via Splash. Through coaching, she’s realised that swimming teaches you more than just swimming. For example, Splash empowers people and gives them the confidence to go on and do other great things. Edie shared that one of the students went on to climb to Mount Everest Base Camp, and some have even taken up open water swimming. If it weren’t for the fact that they were able to conquer the first goal of being able to learn to swim, they might not have been able to go and conquer bigger goals. Some participants also come back to be coaches, which is a fantastic way to create role models for the students. It seems to me that Edie doesn’t realise that she too is an exceptional role model to her students, showing them what they can achieve once they learn how to swim. While Splash has created a supportive community, and at the heart of this community lies role models such as Edie, who have conquered the seemingly unconquerable, and shown everyone that it is possible. After listening to Edie’s story, I couldn’t help but wonder how she was able to make time for it all. She laughed quietly; obviously this was a question she was regularly asked. Having Splash grow has allowed her to take a step back from coaching and focus more on fundraising for the charity — though coaching is the most rewarding part for her. Now that she has one long distance swim under her belt, she has the confidence to do more challenging swims. She didn’t start 2018 planning on doing the HK360, so who knows what 2019 will bring? Edie’s excited to see what long distance swim she will tackle next. It’s like the movie Finding Nemo. I’ll always have a desire to find my way back to the ocean.